I heard a story this week about a player who found her winning streak just a little hard to believe since she just happened to have her run of good luck on April Fools Day! It took a phone call to Liberty Slots Casino before she really believed it but yes, she really had turned her weekly $25 deposit into $100,000. ‘Ellen' deposits $25 almost every week. Like all of us, sometimes she wins, sometimes she doesn't. 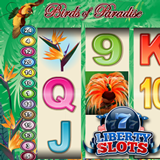 On April 1 she was playing her favorite slot game, Birds of Paradise. Wanting to stretch her weekly budget she started by wagering a modest $1.25 per spin. Then, though, a couple of Free Spin features where all wins are doubled gave her enough of a bankroll to really take the game for a ride. She increased her bets from $5.00 to $12.50 and then to $25 after hitting payout after payout. Eight hours later, when she was still winning, she was betting $125 per spin. When her account balance hit $100,000 she decided to call it a day. A player had trouble believing she'd won $100,000 at Liberty Slots Casino since it was April Fools Day. "I had to keep pinching myself whenever the wins happened," said a breathless Ellen from her home. "I knew it was April 1st so I actually phoned Liberty Slots to make sure this was for real! I've played here for a couple of years now, I love the games but this has been the most exciting day I can remember." Liberty Slots casino manager Mark Ramirez spoke to Ellen and assured her the wins were real. "You're always expecting something that's not quite believable on April 1st! This is a significant win and this player played it beautifully. Congratulations to Ellen on her very special April Fool's Day." Liberty Slots has dozens of games from Wager Gaming Technology. Daily slots tournaments played on Jester’s Wild will award $500 in prizes every day until May 2nd.